A new discovery about the way things stick together at the very small scale could help engineer micro- and nanoscale devices. 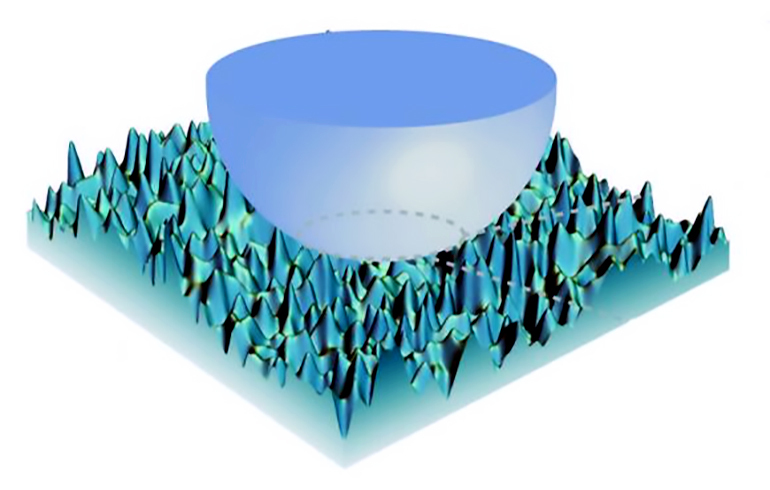 In a series of papers, the latest of which appears in Scientific Reports, researchers show that miniscule differences in the roughness of a surface can cause surprising changes in the way two surfaces adhere to each other. Certain levels of roughness, the studies show, can cause the surfaces to exert different amounts of force on each other depending on whether they’re pushing together or pulling apart. “At the sub-micron scales, the adhesive forces become dominant, while the force due to gravity is essentially meaningless by comparison,” says Haneesh Kesari, an assistant professor in Brown’s School of Engineering who oversaw the research. This line of research started a decade ago when Kesari was carrying out experiments to test adhesion at small scales. To do this at the micro-scale, Kesari used an atomic force microscope (AFM) apparatus. An AFM is a bit like a tiny record player, where a cantilever with a small needle hanging from one end drags across a surface. By measuring how much the cantilever jiggles up and down, researchers can map out the physical features of a surface. For Kesari’s experiments, he modified the setup slightly. He replaced the needle with a tiny glass bead and used the cantilever to simply raise and lower the bead—bringing it in contact with a substrate and then pulling it back off over and over again. To make the substrate, researchers used PDMS, a squishy polymer material often used in microscale engineered systems. The cantilever measured the forces that the two surfaces exerted on each other. The experiments showed that as the bead and the PDMS came close together or were just barely touching, there was an attractive force between the two. When the two were fully in contact and the cantilever continued to push down, the force flipped—the two solids were trying to push each other away. When researchers raised the cantilever again and the two solids moved apart, the attractive force returned until the gap was large enough for the force to disappear entirely. Those results, in line with how scientists usually think adhesion works, weren’t surprising. The surprising part was this: The amount of attractive force between the bead and PDMS substrate was different depending on whether the cantilever was on its way up or on its way down. Kesari performed the experiment in several slightly different ways to rule out confounding factors, like liquid-based suction between the two surfaces or some kind of tearing of the PDMS polymers. After showing the effect he detected wasn’t an artifact of any known process, he set out to figure out what was happening. “There’s plenty we can do by engineering at the micro- and nanoscales,” Kesari says. “But it will help if we have a better understanding of the physics that is important at those scales.